SAN RAFAEL, CA--(Marketwire - March 8, 2011) - Publisher iUniverse, Inc. announced this week that San Rafael resident Lucia Campilongo's top selling guide, Lucia's Survival Guide and Cookbook, has been selected to lead their featured book presentations for the month of March. Founded in 1999, iUniverse is a nationally recognized publisher headquartered in Bloomington, Indiana. In 1980, Gina Campilongo was leaving to study abroad in Italy, as an American undergraduate who had never lived on her own before, much less in another country. The problem? Gina could barely boil water, let alone survive and adjust to living in a different culture. Needless to say, her mother, Lucia Campilongo, was worried. She considered the myriad of challenges Gina would face, and began journaling them, in a handwritten notebook. Each time she thought of a problem that Gina might face, she'd pick up the notebook, and write like crazy. 25 years later, Gina honored her mother's love-in-action by publishing the guidebook, Lucia's Survival Guide and Cookbook, as a Mother's Day surprise. "To say I was amazed is an understatement," Campilongo said. "I was thrilled to be able to pass on my life-lessons. How often does a homemaker get that opportunity?" Nothing could have prepared Campilongo for the success that followed. A local newspaper published the story of the book, and what began as a simple act of love and learning took on a life of its own. Shortly after the story printed, Campilongo was honored by a local restaurant that hosted a book signing and included Campilongo's recipes in its menu. "What a treat it was to see 'Lucia's Special' in a restaurant, instead of just in my own kitchen," said Campilongo. When NBC discovered her story, Campilongo was invited to appear on NBC's The Today Show along with her daughter and granddaughter, giving survival tips for the 'domestically challenged.' Campilongo said host Meredith Vieira calmed any nerves she might have had. "Meredith took a sincere interest in the book and its use through several generations of my family," said Campilongo. "I still can't believe we shared that moment with some six million viewers." After the interview, Campilongo was asked to train chefs in Sicily, but politely declined. She said the amount of traveling would be "a bit too much." An Editor's Choice title, Lucia's Survival Guide and Cookbook quickly became an iUniverse bestseller. "I had no idea it would strike such a common chord with so many people," said Campilongo. "I wasn't even sure if Gina would use it back then, let alone anyone else decades later." Campilongo attributes much of her success to the way readers relate to her book. She believes the book is 'very user-friendly' for those with limited experience. "It is written as if you have someone standing over your shoulder, telling you what to do, but with a friendly, guiding voice," said Campilongo. "It was not written to be academic or intimidating. Betty Crocker, no, but Mama Lucia, yes." Since the book was published, Campilongo has received an overwhelming response, but her first commitment remains to her three children and four grandchildren. "Just the fact that my life-long commitment as a homemaker and looking after my wonderful family has been recognized to this degree brings a level of satisfaction words cannot describe," she said. Whether you're a young adult leaving home for the first time or an anxious parent nudging your precious offspring out of the nest, Lucia's Survival Guide and Cookbook is a fun and easy manual for anyone faced with the daunting task of creating their first home. Filled with helpful tips on everything from the first trip to the grocery store to removing the worst laundry stains, this guidebook is a no-nonsense primer for all the basic tasks involved with homemaking. Easily adaptable to any new living situation, the guide comes complete with everything you need to know for keeping a clean, comfortable home. It also includes an Italian cookbook with recipes which even a first-time cook can quickly master. "The art of traditional homemaking has been lost in this age," says Campilongo. "Not only do I hope to rekindle those ideals but also bring back together the family unit. The ideas in my guide will help you live in comfort and cleanliness. Your clothing will be immaculate and wrinkle-free, and most importantly, you will EAT WELL!" Lucille "Lucia" Campilongo acquired her culinary skills from her parents who immigrated to the United States from Ragusa, Sicily. A seasoned, enterprising and proficient homemaker, she has always prided herself in the profession and art of homemaking. She still enjoys generously sharing the fruits of her profession with her husband, three children and four grandchildren. 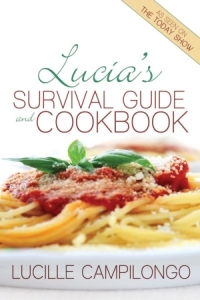 Lucia's Survival Guide and Cookbook can be purchased from www.iUniverse.com, www.luciasbook.com, www.amazon.com or through any online bookseller.